California Highway 1 runs along the north California coast for 137 miles, from Bodega Bay in the south, near Point Reyes, all the way to Rockport, until the high cliffs of the Lost Coast force the road inland. For all this distance the road is never more than a mile from the Pacific except for a short section around Point Arena, where the route moves away from the ocean for a few miles, to avoid an area of sand dunes and the lower end of the Garcia River. The point is a narrow, grassy promontory formed by orange-brown cliffs of unusual tilted and eroded sandstone, 60 feet above sea level, and is guarded by the historic Point Arena Lighthouse, in operation since 1907; a previous model was destroyed by an earthquake in April 1906, this being very close to the San Andreas Fault. The cliffs recede just north of the point, giving way to a long, usually deserted sandy beach, part of nearby Manchester State Park, but the promontory is more scenic and interesting, because of the fascinating rock formations, which include terraces, arches, caves, coves and sea stacks, all formed of thin-layered sandstone angled at up to 70 degrees. 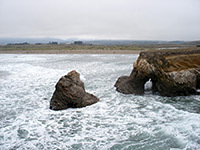 The lighthouse and the point are reached by a 2 mile spur road forking off Hwy 1 just south of the Garcia River, and 2 miles north of the quaint namesake town of Point Arena. Entry to the lighthouse is $7.50 (2019) but there is no charge to park along the access road and explore the headland. 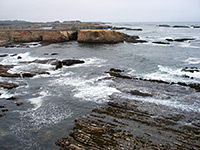 The road runs close to the western edge of the promontory, right above the highest cliffs, extending southwards to a particularly irregular section of the coastline with many low, protruding ridges, small islands and terraces exposed at low tide. The sharply-angled strata form about 95% of the height of the cliffs, being topped by a thin band of horizontal-bedded sandstone that slows the erosion of the underlying rocks. The steepness prevents easy access to the water's edge though it is possible to climb down in a few places. 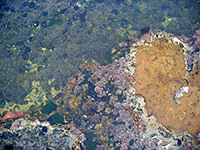 and view the tide pools below. 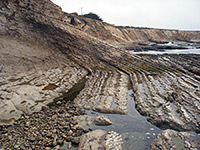 As some of the terraces beneath the cliffs are quite flat, incoming waves from a rising tide can suddenly reach much further than previous waves, so some care is needed. 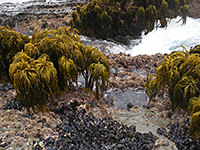 The rocks and pools have quite abundant life including sea palms, kelp, anemones, sea stars and mussels. 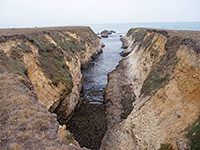 On the north side of the promontory are several inaccessible, steep-sided coves where much driftwood and broken kelp collects, while to the east the land is equally sheer, and the cliffs continue southwards alongside the Garcia River, preventing any access to the long beach on the far side of the river, part of Manchester State Park. It only takes an hour or so to view all the peninsula but the scenery is varied and photogenic. The original brick and mortar lighthouse at Point Arena was built in 1870; its 1907 replacement is 115 feet high and was the first to be made from steel and concrete. The guided tours (between 10 am and 3:30 pm) allow visitors to climb right to the top, and view the museum, outbuildings and the westernmost reaches of the promontory; also available are three restored lighthouse keeper's homes, available for rental for overnight stays, with prices in the range $150 to $300 per night. One incidental point of interest is that the peninsula is the closest part of the contiguous USA to Hawaii (2,360 miles), and so was chosen as the start point for the trans-Pacific cable lines, whose placement started in 1956. 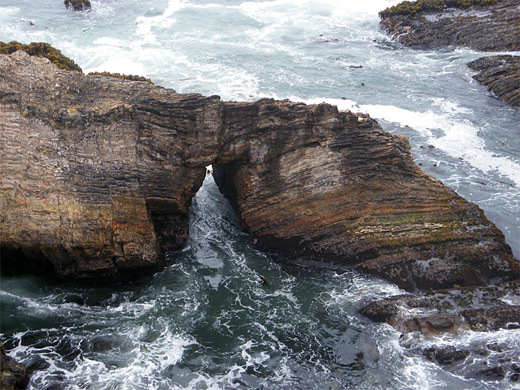 Point Arena is a long way from any large cities; the closest places with chain hotels are Fort Bragg (45 miles), Ukiah (50 miles) and Cloverdale (57 miles).